Summary: How to make fine jewelry? Maybe you think it is difficult to make. In this post, we will tell you a way to diy easy bracelet. This bracelet is beautiful. You will love it. 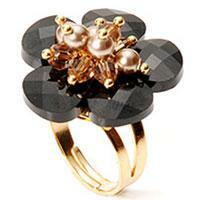 Fine jewelry doesn’t exist only in jewelry store. You can make it by your hands. And the jewelry you made is unique. But you may wander how to make fine jewelry. Next, we will diy easy bracelets. And you can make with us together. It is very exquisite. How to make fine jewelry? Step1: String polished pearl beads and seed beads at intervals. And thread the wire through the beads for circles to tighten the loop. 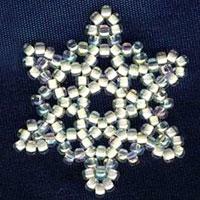 And then clockwise slide seed bead and pearl beads altogether 7 beads. Step2: Continue stringing beads in the same way with step1 until you get enough lengthen. And string four bicone Swarovski crystal beads to the center of the pearl beads in the way as picture shown. Step3: String Swarovski crystal beads to every center of pearl beads, emerald and chrysolite beads are added alternately. Then add the bottom with stringing seed beads and flower beads to the wire of one end. Step4: Form the loop. Slide seed beads onto the wire of another end. Make sure the loop is a little bigger than the bottom. So you get a nice bracelet. It seems like crystal flowers appear to float across this elegant right- angle- weave bracelet. I believe you have known how to make fine jewelry. Hope this bracelet gives you some idea to make you diy more easy bracelets.